Who can resist a Cream Corgi? Fans of Hasbro's Littlest Pet Shop will likely squeal with glee upon seeing Gameloft's iPhone and iPad effort inspired by the re-imagined toy line. Available for free, the game takes a page (more like the book) from Godzilab's Happy Street by allowing players to create their own towns filled with up to 150 different pets, from Dancing Horses to Quirky Kitties. That said, gamers (we'll go out on a limb and guess young girls) will discover a charming virtual world filled with furry and undeniably cute critters in desperate need of affection. Resisting the urge to love these adorable pets is futile, of course, especially when you stare into their big, love-filled eyes. To that end, the developers did quite a good job instilling these animals with personality and subtle differences when it comes to basic care. Horses, for instance, crave a good brushing, while dogs love soap. This ties into one of the mini-games, designed to help players earn virtual currency and unlock new pets along the way. While very basic and inevitably monotonous, the act of bouncing a ball, blow-drying a horse's mane and flicking treats into a waiting cat's mouth let players take a break the primary goal of adding as many homes and other buildings as possible. That is, of course, the main focus of Littlest Pet Shop, to custom create one's personal town by spending both Kibble and Bling, the latter of which is tougher to come by through normal play. There is, however, a wide selection of missions to complete to earn the former, with the list covering the basics and then some, from purchasing toys for these pets to bringing a vet to town. Thankfully, Gameloft doesn't make things too difficult. Homes eventually become expensive, with the opportunity to acquire more Bling ever present, but it doesn't take long to score lots of Kibble, and there are enough free activities to partake in. Granted, players will resort to grinding over filling their virtual money banks straight away, but regardless of how much Kibble and/or Bling someone has, there's always something to do. Not only that, but the chance to visit other people's towns results in design inspiration, and also some free Hearts, which come in handy for winning items from a capsule toy machine. Beyond that, Gameloft deserves a ton of credit for capturing the spirit of Littlest Pet Shop. Each building resembles a toy play set, and the pets also bear a welcome resemblance to their plastic counterparts. We were also surprised to hear a lot of voice acting from specific characters. Much of it repeats, but we'd rather have that than nothing. Quite frankly, this game won't win any awards for originality, but that doesn't mean it's bad. On the contrary, Littlest Pet Shop does the franchise proud, and will definitely please fans eager to populate their towns with cuddly friends. 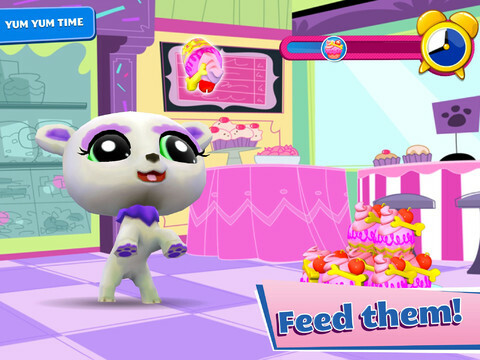 An Android version of Littlest Pet Shop will be available in the near future. 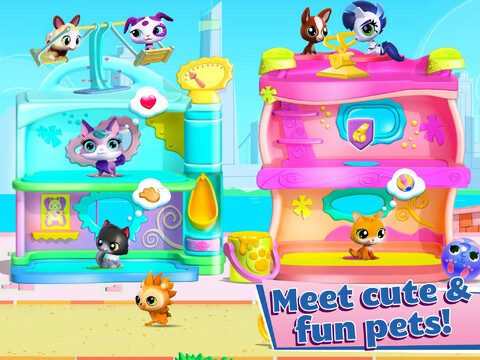 What's Hot: Captures the essence of the Littlest Pet Shop toy line, utilizes elements from Happy Street to great effect, 150 pets to collect, visit friends' towns, win daily prizes. What's Not: Repeating mini-games, things eventually grow too expensive.